It’s a season of abundance here. The fruit trees are heavy laden, and the vegetables are ripening faster than we can pick them. We scramble each day to collect in the harvest and to store and preserve as much as possible. At the same time we try to use as much of the produce as we can in our cooking so that we can enjoy the fresh bounty of the season. With the peach trees on the roadsides covered in fruit, now is the perfect time to be eating them, as well as using them in our cooking. 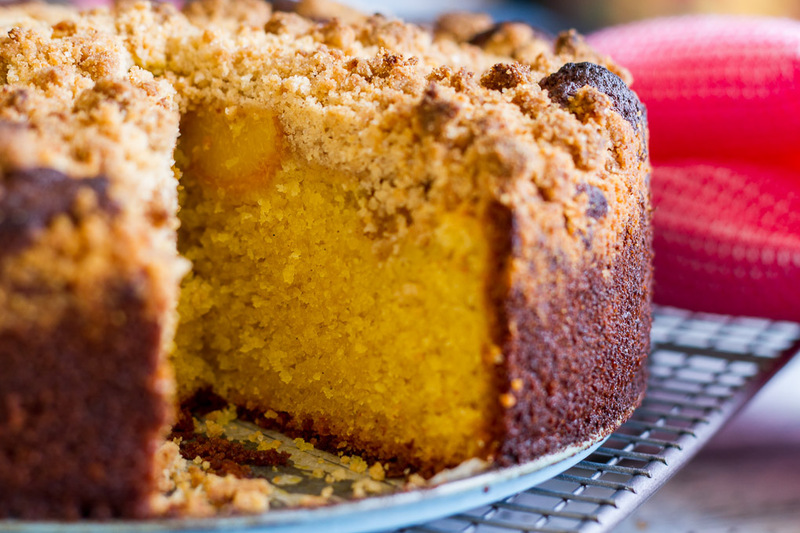 This peach streusel cake is a perfect example of how we try to use as much fresh produce as possible. All our cakes, muffins, and desserts have fresh fruit in them at this time of the year. 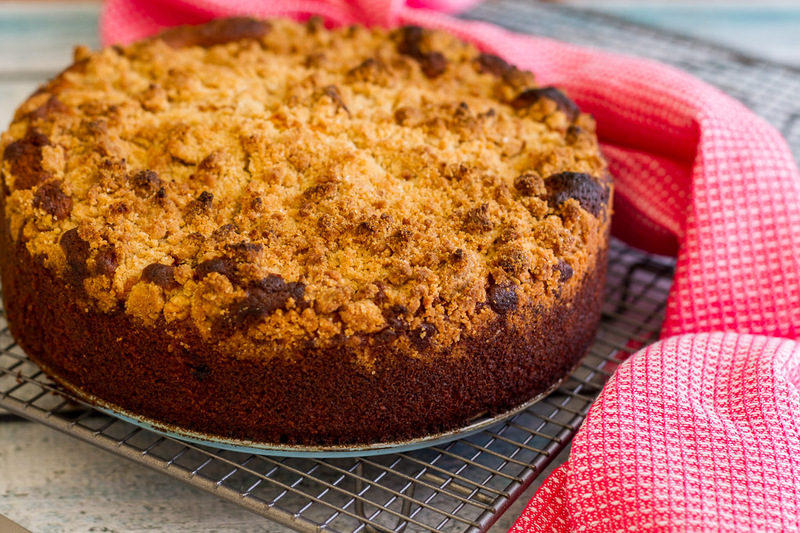 The streusel topping is sweet and crunchy, and matches with the freshness of the fruit. My oven is getting to the end of it’s life. It’s getting harder to control the temperature, and it’s temperature is uneven at the best of times. I’m dearly looking forward to a new one when our extension gets going (not too long now!). Then I won’t have anything to blame if I slightly over cook my cake. Cream the butter, sugars, and vanilla. Stir in the flour and milk alternately. Spread the mixture into a greased and lined spring-form tin. Press the peach quarters into the batter. Use your finger tips to rub the topping ingredients in together. Bake at 180*c for approximately an hour. If you don't have fresh peaches, use frozen or canned peaches instead. Do you love a fruit dessert? Oh doesn’t this sound delicious. 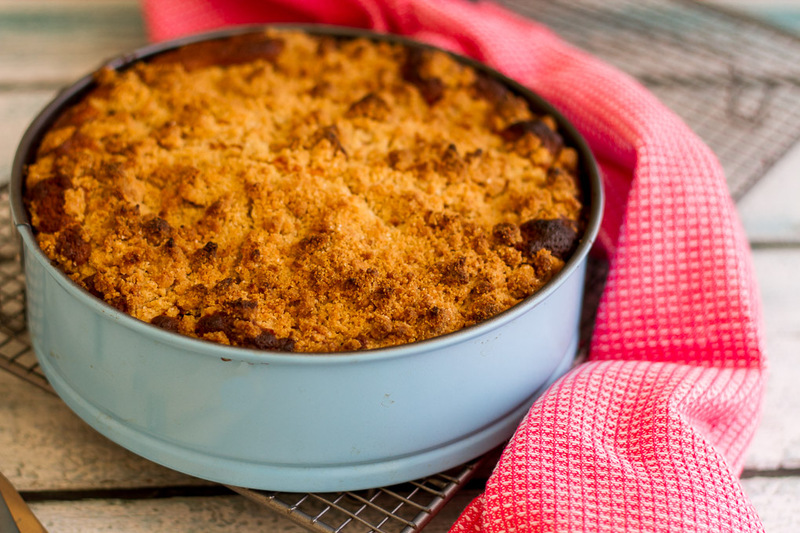 My aunt in the US taught me to make a peach cobbler when I was there, very fitting seeming she was from Georgia. I love peaches, I find they change taste when you cook them too, sweeter and caramel like in a way. So yum. This looks fantastic I make one with blueberries which is yummy. I am going to give this a try. Blueberries would be delicious too! This looks delicious. My oven seems to be on the really hot side so I struggle to get cakes right at the moment. 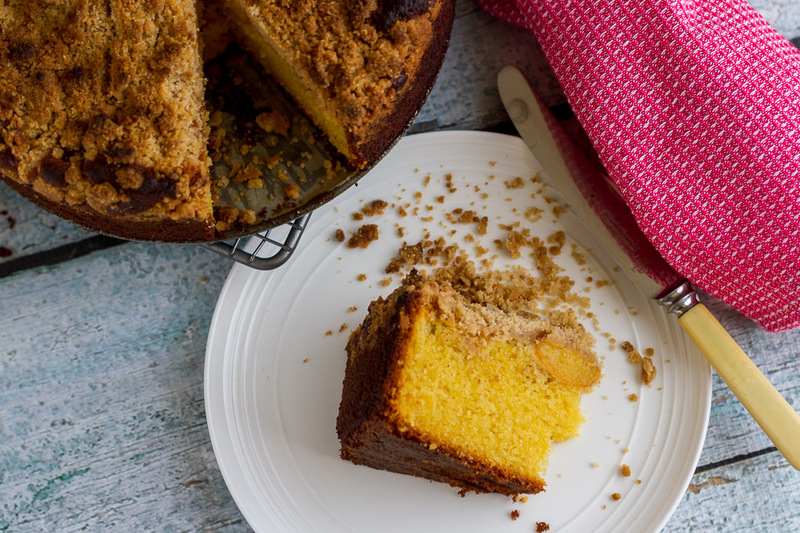 I love this streusal topping. Looks yummy. My son makes peach or apricot kuchen with the sour cream topping. Also yummy. I have a temperamental oven too. Son and Dil were here for breakfast on Saturday before going overseas for several months to China. I forgot to warn her about oven and the keeping warm bacon turned out to be crispy bacon chips. Tasted ok, so we are it.